This Persistence Market Research report examines the global coil wound devices market for the period 2017–2025. Sensors are coil wound devices that use induction coils with ferromagnetic cores to sense the magnetic field produced by alternating electric currents. A bobbin is a permanent container for a wire, acting to form the shape of a coil. It may be made of thermoplastic or thermosetting (e.g. phenolic) materials. In order to have an ease of understanding and for the better organization of the report, the report on global coil wound devices market has been divided into four distinct parts. The first part of the report contains the introduction section that contains the executive summary of the report along with the market taxonomy and the definition of coil wound devices. This valuable section of the report also contains information on the region wise coil wound devices pricing. Also, this section of the report contains information on the market viewpoint and the macroeconomic factors operating in the global coil wound devices market. Besides, information is also provided on the value chain analysis of the global coil wound devices market and regulations that are applicable in this market. The second part of the report contains the global coil wound devices market analysis and forecast by application, device type, end-use sector and by region. This section of the report contains important market numbers in the form of market attractiveness index, incremental dollar opportunity and basis point share analysis. The third part of the report contains the regional coil wound devices market analysis and the regions are chosen as per the market taxonomy. In this section of the report, the regional market numbers are discussed in great detail along with the regional drivers, restraints and trends affecting the respective regional markets. The last part of the report features the competition landscape of the global coil wound devices market and has information on the key players operating in this market. The competition landscape contains detailed information on the important companies operating in the global coil wound devices market in the form of company description, product overview, key developments, strategic overview and key financials of each of the featured companies along with the SWOT analysis of the companies. This competition landscape is a valuable part of the report as it contains all the necessary information to study the leading companies operating in the global coil wound devices market in detail and also reveals how they implement their strategies and vision to stay at top in this highly competitive market. Overall market size has been analysed through historical data, primary responses, and public domain data. Revenue of companies in the global coil wound devices market has been benchmarked to ascertain the market size for the base year. Macroeconomic indicators such as GDP and industry growth have been considered to forecast the market size over the forecast period. The historical growth trend of end-use industries, market participants’ performance, as well as the present macro-economic outlook has been taken into consideration for estimating the overall market trend forecast. This data is then validated using the triangulation method and is extensively scrutinised using advanced tools to garner quantitative and qualitative insights into the global coil wound devices market. Increasing per capita consumption in emerging countries has led to an increasing demand for efficient coil wound devices for various industries such as automotive, food and beverages, pharmaceuticals, and agriculture, among others. This, in turn, has increased the shipment of electronic devices, and appliances which in turn has been a driving factor for the global coil wound devices market. As of 2014, the urban population accounted for 54% of the total population globally and is expected to further increase at a healthy pace. Substantial growth in the service and manufacturing sectors has led to a healthy growth in GDP worldwide. This, in turn, has had a positive impact on the global spending on smartphones, thereby eventually impacting the demand for coil wound devices. Global GDP is projected to register a steady growth during the forecast period owing to higher rate of industrialization in emerging economies such as Asia Pacific. Moreover, increasing adoption of coil wound devices in the automotive sector is anticipated to fuel the demand in near future. Advancement and replacement of aging power infrastructure in the U.S. is one of the key factors driving the coil wound devices demand in North America. The aging electricity infrastructure will require new technologies to enable better failure detection. Traditional systems do not meet many emerging trends, such as growing penetration of distributed generation resources and need for greater resilience. The new transmission technologies combine power electronic devices with capacitors and inductors to provide a range of controlling capabilities for transmission and distribution systems. The demand for coil wound devices, especially transformers, is anticipated to witness a notable growth as they are important components that are used for carrying out electric grid transition from traditional designs to the designs of future in the coming years. In 2017, the U.S. government decided to withdraw from the 2015 Paris Climate Agreement. This step is likely to cause solar and wind deployment rate to move slowly, ultimately slowing down the ongoing transition to renewable energy. The pace of renewables growth will also be affected by numerous separate policy decisions, including the Clean Power Plan, Investment Tax Credit and Production Tax Credit for renewables and by the addition or reduction of restrictions on fossil fuel production and consumption. It is anticipated that these steps will negatively impact passive components demand, devoted to developing environment-friendly technologies for alternative energy. However, the impact is expected to remain minimal, largely offset by other driving forces. As per the data provided by Persistence Market Research, the transportation segment in the end-use sector was estimated to be valued at nearly US$ 18,200 Mn in 2017 and is anticipated to reach a valuation of nearly US$ 27,900 Mn in 2025, exhibiting a CAGR of 5.5% during the period of assessment 2017-2025. 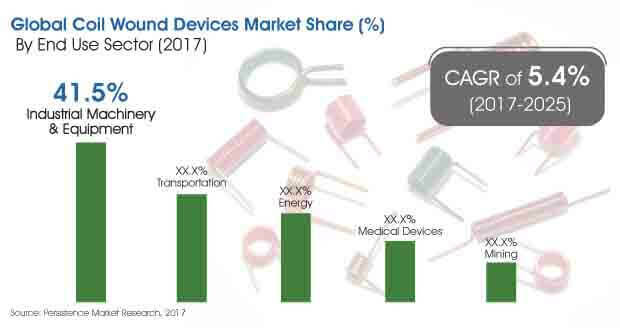 The medical devices segment in the end-use sector was estimated to be valued at nearly US$ 9,000 Mn in 2017 and is forecasted to reach a valuation of nearly US$ 14,200 Mn in 2025, displaying a CAGR of 5.8% during the period of forecast. Murata Manufacturing Co , Ltd.